Meat, fish and dairy produce were mainly traded in this market with the nearby Candleriggs offering fruit and vegetables. 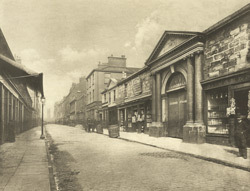 Annan was commissioned by The City Improvement Trust to document the inner- city streets which were scheduled for demolition and reconstruction by an act of Parliament in 1866. In his introduction to 'The Old Closes And Streets Of Glasgow' William Young explains that this newly acquired right "to alter and reconstruct several of the more densely built areas of the city...would remove many old and interesting landmarks."